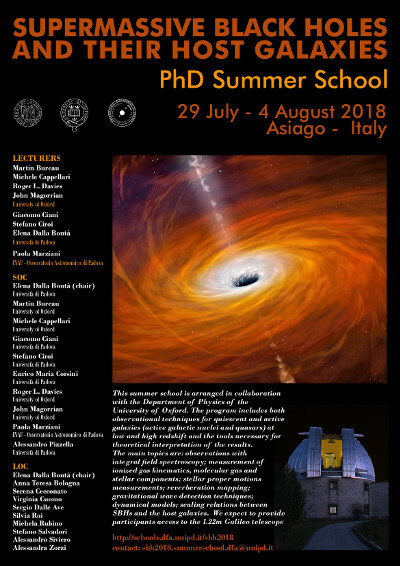 This course will provide a comprehensive overview of contemporary research into supermassive black holes (SBH) at galaxy centres. The program includes both observational techniques for quiescent and active galaxies (active galactic nuclei and quasars) at low and high redshift and the tools necessary for theoretical interpretation of the results. The main topics are: observations with integral field spectroscopy; measurement of ionized gas kinematics, molecular gas and stellar components; stellar proper motions measurements; reverberation mapping; gravitational wave detection techniques; dynamical models; scaling relations between SBHs and the host galaxies. We expect to provide participants access to the 1.22m Galileo telescope. To stimulate interaction and possible future collaborations, all attendants will have the opportunity to give a 15 minutes talk and/or to present a poster to describe their research. Giacomo Ciani, Stefano Ciroi, Elena Dalla Bonta` from Universita` di Padova, Paola Marziani from INAF-Osservatorio Astronomico di Padova. The registration fee is 150 Euros and includes: transfer by bus from Padua to Asiago (and back), full board in hotel and social event.